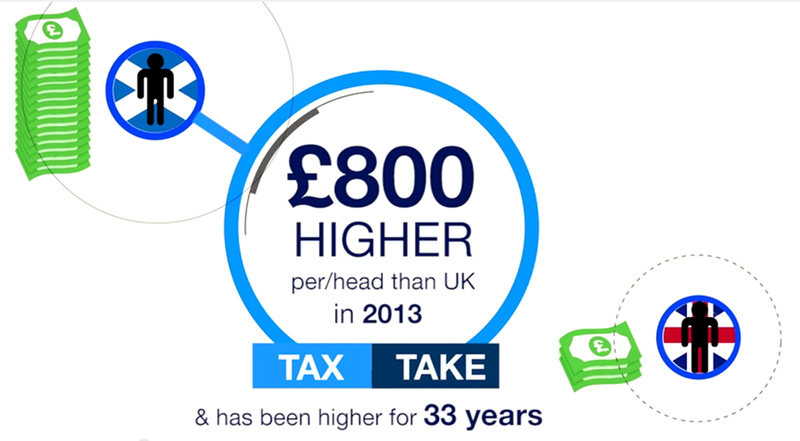 Response to "Independence and the Economy - The Facts"
You have probably been directed to this post because you have watched a rather slick video from "Business for Scotland" rather hilariously titled "Independence and the Economy - The Facts". I'd provide a link but they block even the most mildly critical comments so I'd rather not boost their traffic figures. All of the exhibits used are captured below. For those who are unaware, I have discussed this (self)interest group at length here > Who are Business for Scotland - this video represents a new low in their attempts to mislead the public. Notice how only tax take is mentioned not public spend? This is because public spending was of course also higher over that period - if they showed expenditure as well it would be more informative and show a far more balanced picture1 (which is of course why they don't). This carefully selected 33 year time period includes the 80's when the main surge of Oil revenues was experienced. The Union has been around for over 300 years; imagine what these figures might look like if we went back 60 years? (unfortunately we can't as such stats don't exist because reporting that splits Scotland from UK only starts at the point of "it's our oil"). This is true if you take a crude GDP/Capita measure. There's a problem with this measure as has been widely commented (e.g. see this Guardian article): because so much of our GDP is owned by overseas firms (Oil & Gas, Whisky, Banking, etc.) the benefit doesn't fall to Scottish citizens. Per the link above GNP (which factors in where the "production" is owned) is accepted by economists as a better measure. On a GNP/Capita basis (see the primary research) iScot is behind the UK (probably - it's hard to work out). The weakness of GDP/Capita as a measure is illustrated by the fact that Ireland ranks above Scotland on that basis (while suffering high unemployment, declining domestic demand, record business closures etc.) - hardly a "wealthy country" in any meaningful sense. BfS have been throwing this £8.3bn figure around for a while now. They claim GERS as the source but the number doesn't appear anywhere in GERS. They provide no further justification and have ignored several requests to explain it. Given the BfS track-record it's hard to take this number seriously. Update: since writing this post BfS have been shamed into explaining this number - and it's palpable nonsense. 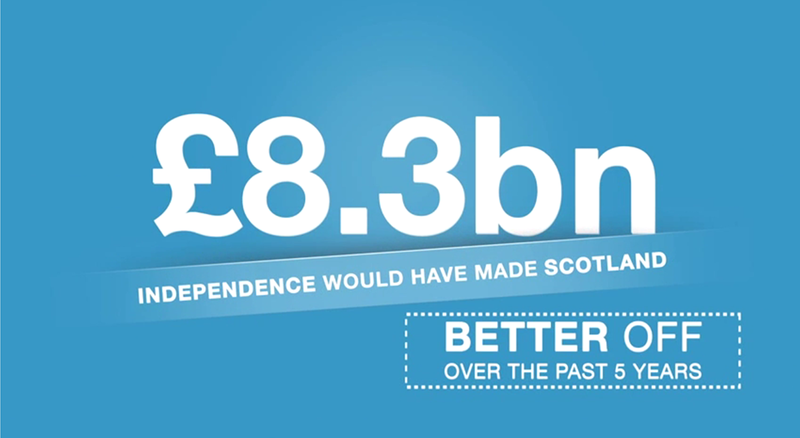 Their "argument" is that we should have incurred a further £8.3bn of debt and that would have made us "better off". This is like saying I would have been better off if I'd been allowed to run up a bigger credit card debt. Full explanation here > £8.3bn Better Off? Can you spot the "per term" small print? So presumably this means £875m pa. There is no back-up for this figure of course and the White Paper doesn't help. The IFS concluded: "The White Paper outlined specific tax raising measures and spending cuts that would together save just under £500 million a year. On top of this there is an aspiration to raise a further £235 million through, as yet unspecified, measures to remove exemptions and reduce tax avoidance". So £875m is a stretch. For context: Nuclear is 5% of the UK defence budget and supports thousands of jobs in Scotland; scrap it and we'll be "anti-nuclear" so it's hard to see how we'll gain membership of Nato ("anti" is not the same as "non"). The House of Lords costs Scotland about £9m p.a. so is irrelevant in these figures. Every manifesto claims it will "reduce waste"; let's see how much waste Holyrood generates. And what about the spending side of the equation? The IFS go on to say "The spending increases and tax cuts described in the White Paper are more numerous and more costly – around £1.2 billion a year in the short term and potentially considerably more in the longer term if full aspirations for childcare and state pensions are met". 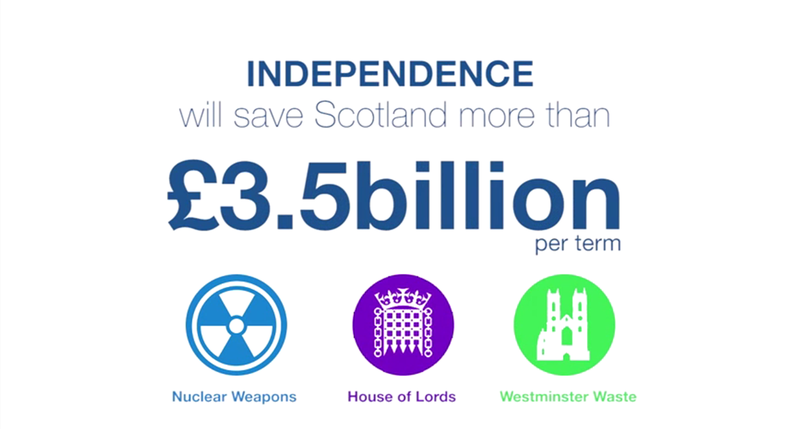 So the IFS estimate that an independent Scotland would in fact be £500m to 700m worse off. This would at least help explain why John Swinney recently had to admit that in the first 3 years of independence an iScotland would actually be increasing borrowing by billions (£2.4bn in 2018-19 alone). Developing renewable energy capacity requires massive investment; this currently comes from rUK subsidies. 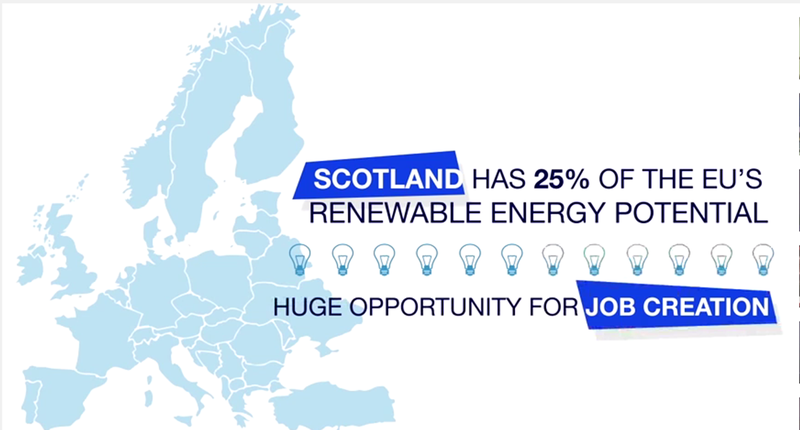 If Scotland becomes independent the rUK would look to invest in their own renewable capacity (eg. offshore wind-farms) rather than those of a foreign country. In addition the rUK would look to source cheaper renewable energy from eg. Iceland or Norway which offer a cheaper option than subsidising Scottish renewables (and the inter-connect capacity is coming on-stream to enable this). It's a downside of independence, a downside of breaking the single UK energy market. Looks like they were running out of ideas by this stage. This exhibit says *if* we increase exports by 50% then we'd create jobs. Hold the front page! What will drive this theoretical growth in exports is a mystery: the White Paper mentions that we will have a "a streamlined system of overseas representation focused on Scottish citizens and priority business sectors". That means we will only partially replace the existing international diplomatic and trade network infrastructure. *If* indeed. Cutting Air Passenger Duty? Hardly the most "green" policy I've heard of. 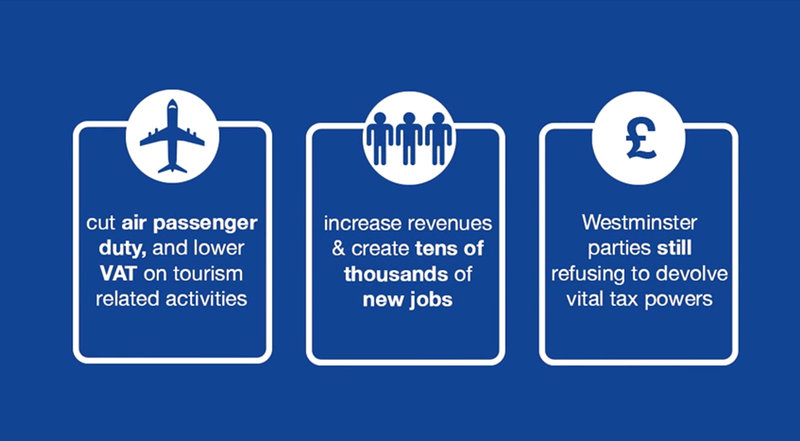 Lower VAT on tourism? That's a new one (not aware of it being Scot Gov policy) - wonder how that will fit with EU membership conditions around VAT harmonisation? Well there are a lot of small independent nations and plenty of them are struggling too so not really sure what the point of this exhibit is. And where's Ireland? It has an even better GDP/Capita than Scotland so following the logic of these exhibits it's "wealthier" ... there again we can't really say it's thriving can we? 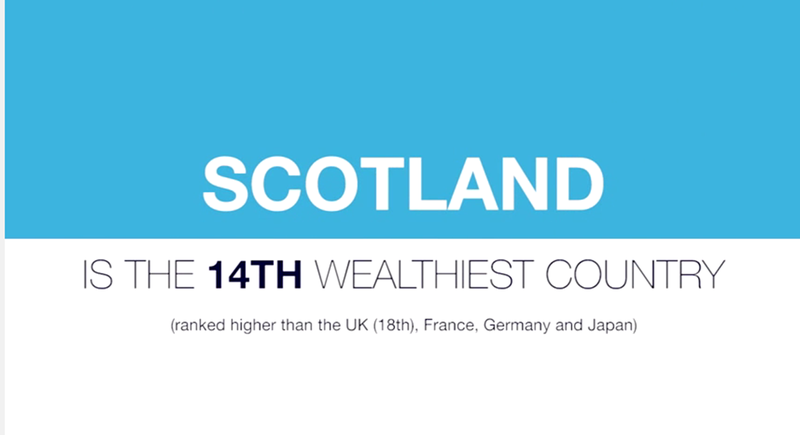 And are we really comparing the Scottish Economy to that of Switzerland? This entire video insults the intelligence of the viewer. 1. This is the net fiscal balance over that period sourced from the Fiscal Commission Working Group; as you can see there was a burst of net contribution from Scotland to the rUK in the 80's (we were in a Union, we shared our Oil & Gas windfall as we should have done) but since then in fact we have effectively "kept our oil" in terms of higher expenditure. Let me restate that: for the last 25 years Scotland have effectively "kept our oil" despite being in a Union with rUK. "For too long, the referendum debate has been presented as one side representing Scotland and the other side representing Britain. In fact, the real debate is between two Scottish visions of Scotland's future – the nationalist one based on the breaking of all political links with the UK and our vision based on a strong Scottish parliament backed up by a system of pooling and sharing risks and resources across the UK." There will be many detailed posts to come so to help keep a logical thread in place I will attempt to maintain a simple summary of the arguments as I understand them here. I'll try and edit on an ongoing basis, amending as necessary, responding to comment where appropriate, altering my view if persuaded. This is a work in progress, not a completed thesis! "The people of Scotland will always get governments we vote for"
Making a country smaller does not make it in some way "more democratic", it just makes it smaller. That might be better or worse for a variety of reasons, but being "more democratic" will not be one of them. We make a trade-off between the scale of our democratic State and the extent to which we get what "we" want all the time: otherwise why not "Independence for Shetland"? A point that needs clarifying: This is not a vote for self-determination. The vote is self determination, we - the people of Scotland - are exercising that right, not voting for it. We are voting to decide if we'd rather be separated from the Union ("free to pursue 'our' own path") or remain within the Union ("continuing to benefit from pooling and sharing risks & resources across the UK"). Look in the White Paper and see if anywhere the economic implications of the promises made are actually added up. I've looked, I can't find it anywhere. That is an extraordinary failing on the part of those trying to make the case for breaking the Union. Comparing *percentage* of tax revenue versus *percentage* of public expenditure is simply not the right way to look at it (they are percentages of different numbers). It's the *absolute* per capita numbers that count as any economist (or honest politician) knows. All of the above is based on the premise that to show Scotland has been treated fairly within the Union requires us to show that Scotland effectively got to keep its oil revenues in the form of greater public spending. I argue that's not an appropriate way to consider the analysis historically as a part of the Union with the commitments to pooling and sharing that implies. For me it's like saying "If I'd known I had that winning lottery ticket in my pocket I'd never have married you". Norway founded their "Petroleum Fund" in 1990 and have made some tough choices to be able to fund it: the cost of living in Norway is 40% higher than the UK and (for example) the healthcare system is not free at point of use and compares very poorly to the NHS. Now don't get me wrong - the OECD better life index shows Norway comfortably out-performing the UK on most measures. My point is not that Norway made bad choices but rather they made tough and at times unpopular choices to get to where they are. It's all very well - with the benefit of 20:20 hindsight - to say "we could have had an oil fund". The question is not who is saying that now but who was saying that then; can we really assume that an independent Scotland would have made different choices? 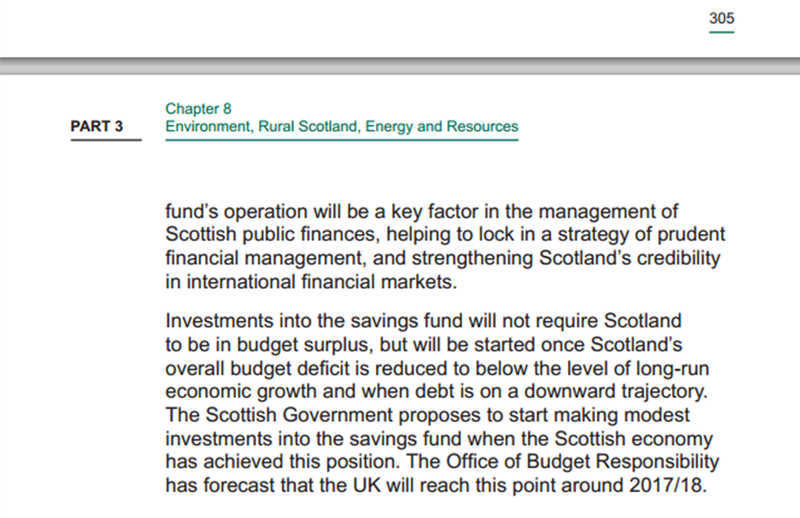 I found one mention of the possibility of a Scottish oil fund in the 2005 manifesto; nothing before and nothing after. Norway is mentioned once in the 1997 manifesto and only reappears in 2007 (when it is mentioned 5 times). The first mention in Hansard is an early day motion in January 2002. To put the level of noise made about an oil fund into context: my Hansard searches turned up 68 results relating to "Oil Fund" compared to 674 results relating to "Scottish Gaelic". 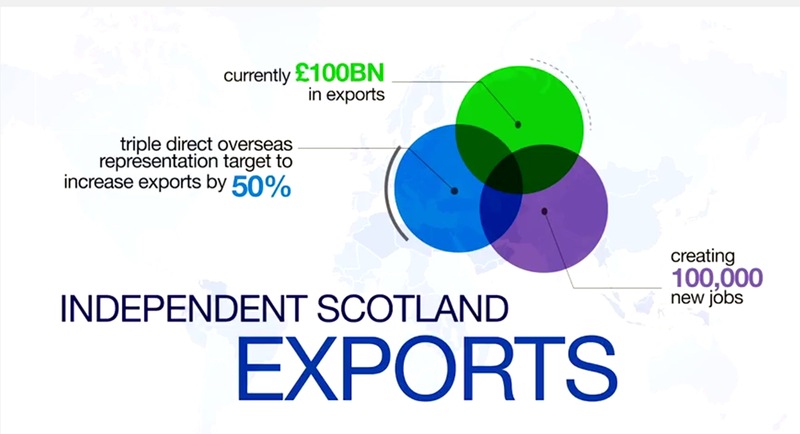 Two-thirds of Scotland's exports go to rUK ("rest of UK); as a direct consequence many jobs in Scotland are contingent on seamless trading between Scotland and the UK. In fact (as elaborated in my post Business for Scotland: Who are they?) current best available estimates are that 37% of jobs in Scotland depend on links to the rest of the UK. That independence will impact that trading relationship is undeniable, the only question is how much and in return for what upside. One of the underpinning drivers for the Independence case is to allow divergent approaches to the EU; this inevitably creates risks for those trading between an iScotland and rUK and therefore for employment in Scotland. It becomes likely (it can be argued as inevitable) that we will have separate currencies within a few years because Sterling-zone participation is incompatible with the conditions likely to be imposed for an iScotland to negotiate continued (constructive) EU membership. This point is important: the White Paper asserts that an iScotland can negotiate to remain in the EU without making any concessions on Euro or Schengen Area participation, while retaining the UK Rebate and other opt-outs and simultaneously improving our share of CAP payments, extending fishing rights etc. This is plainly unrealistic; if you disagree please read my detailed analysis here: Independent Scotland and the EU. Independence creates the conditions where it is possible for one of iScotland or rUK to be in the EU whilst the other is out; where sales from a Scottish businesses to rUK could become cross-border from an EU perspective. That this "one in, the other out" scenario would make trade with rUK more difficult than it is today is obvious. To be clear; it's not inevitable, but it is a significant risk that only a pro-independence vote exposes us to. If one was to pursue a purely rational self-interest argument on this point alone: surely better to be "in the UK outside the EU" than "inside the EU outside the UK"? Assuming both iScotland and rUK remain in the EU (IMHO the likely end-game under an independence scenario) the concessions an iScotland will have had to make (nobody credibly argues concessions won't be required) can only create complications to trade with the UK. Continuing to physically ship goods "across the border" is vital to our economic success; a Yes vote would fundamentally change the risk profile of many Scottish businesses. This is not a marginal issue; this is about employment in and the wider economic success of an independent Scotland. To be absolutely clear: there are other arguments for and against (I will try and cover many of them) but for me this issue is the one which seems least well understood in the debates I have participated in and witnessed. I am NOT saying that an independent Scotland couldn't continue to trade with rUK and EU, I'm NOT saying an independent Scotland couldn't succeed on the global stage: all I am saying is that I am convinced that Scotland as part of the Union will be more successful than Scotland outside of it because of our seamless trading links with rUK. Any credible argument for Independence must be made despite these risks, not in denial of them. If you're not convinced, please read the full post here: Independence & Scotland's Trade with rUK. "the Scottish Government will not seek to re-open budget discussions until the next funding cycle ... the UK rebate will be a matter for agreement between the Scottish and Westminster Governments"
"We will seek to negotiate an uplift in CAP Pillar 2 funding"
"will give Scotland the opportunity to take a leadership role in reforming the Common Fisheries Policy"
You will notice a lot of "seeking to" and "not Seeking to". Nobody should (or reasonably could) believe that all of the benefits and concessions "sought" will be achieved. Similarly nobody is arguing that an independent Scotland could be "forced" into anything either. It's a negotiation, Scotland can decide if the conditions placed on it to remain in the EU are too onerous, can choose not to remain in the EU, can decide to trade-off various elements of the wish-list in return for the benefit of remaining in the EU. It's a negotiation. "In accession negotiations with non-member countries the EU has always strongly resisted other changes or opt-outs from the basic Treaties; at this stage it remains to be seen what might be requested by Scottish representatives concerning the euro or the Schengen area of free movement of persons." If you read the White Paper and listen to the rhetoric used in debate, these issues don't "remain to be seen". It appears Mr Avery's case is not predicated on the same assumptions as the White Paper; or at least he has been careful to distance himself from those assumptions when making his case for a possible negotiated remaining in the EU. I personally think those statements are a tacit admission on his part that the conditions "sought" in the White Paper are clearly unachievable, but maybe I'm reaching a little there. Form your own view. The SNP often adopts the line "we couldn't be made to join [Eurozone or Schengen] because we don't meet the conditions". Yet. We don't meet the conditions yet. Given all new member states have to join, it seems pretty much inevitable that legally binding commitments will be sought from an Independent Scotland to join these arrangements within a set period of becoming a new Member State. As I have mentioned elsewhere on this blog, Chic Brodie (SNP MSP) offered, during a public debate, that in his opinion commitments to join the Euro would indeed inevitably be required. "a modification of the EU Treaties would be necessary"
"[Scotland] could indicate its wish for Scotland to remain in the EU, and this would lead to negotiations in an appropriate framework to prepare the necessary modification of the Treaties. Proposals would be submitted for approval to the EU institutions and the Parliaments of 28 member states". This means every one of the 28 member states has to agree to any Treaty amendments "in accordance with their own constitutional requirements" -- as I understand it that means in some cases even requiring a referendum on the issue in their own country, that it may be necessary for a referendum in France to be held to ratify the Treaty changes required. To quote Alex Barker of the FT on "how do you revise EU treaties": "The conference of member states will have to agree each and every tweak to the treaty by unanimity. All 27 [28 with Croatia] member states hold a veto and could stop the process in its tracks." In my detailed post I elaborate on the broader context, the stances of those we would be negotiating with. There is an excellent summary of the Member states' summarised positions (or lack of position) on the BBC website (here) or read my full post on the topic here: Independent Scotland & the EU. I think we can achieve consensus around this point: an independent Scotland would face an almighty challenge to achieve unanimous agreement from all 28 Member states given the clear (and understandable) resistance from some. So how is an independent Scotland being positioned for this negotiation? As recently as April 28th Alex Salmond was grabbing headlines [Alex Salmond's fisheries threat to EU alarms industry] by claimed that 12 European nations could be barred from Scottish and Norwegian waters if an independent Scotland was refused EU membership. How about the timing of all this? 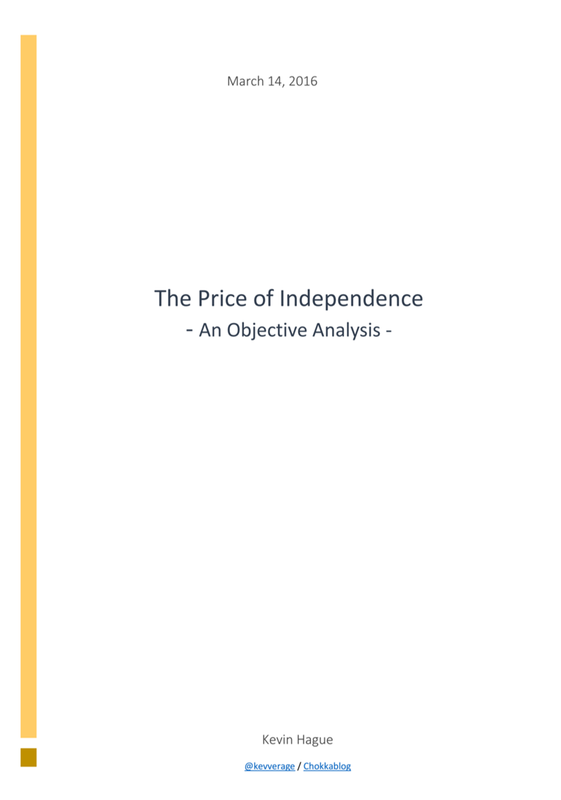 Let me quote again from the White Paper: "The 18 month period between the referendum and the planned date of formal independence provides sufficient time for discussions settling an independent Scotland’s terms of EU membership." If you're arguing to change something that has worked for 300+ years then the burden of proof is yours; you are obliged to make the case for change. Pointing out that the burden of proof has not been met by the arguments presented - that the arguments simply lack logical sense, appear based on irrational resentment, involve sums that don't add up or are based on wildly optimistic assumptions - may be negative, but it's hardly inappropriate. This has been such a contentious issue exactly because it is such a great example of a benefit of Union. There has been plenty written on this topic and I think the jury is in: at best there will be a significant economic cost to an iScotland of any agreement to "keep" the pound (or to pursue "dollarisation" whereby Scotland pegs to the pound). This is a huge issue and worthy of a post all on its own. I think we can chalk the existence of the single energy market, integrated transmission networks and shared support for renewables up as a benefit of the Union. Assets and resources relevant to this include: security & intelligence, border & migration service, Motor services Agency, the BBC and its archives, systems for administering welfare & taxation, Jobcentre Plus, DWP and HMRC offices, the Crown Estate and the defence estate. It will also include assets outside Scotland in which Scotland nevertheless has an interest as part of the UK, such as the overseas missions of the Foreign and Commonwealth Office. NATO membership for iScotland is no gimme - it's worth noting that former Secretary General of the NATO Lord Robertson of Port Ellen stated "He's taking the Scottish people for fools by claiming that [the SNP] would want Scotland to be in Nato but laying down conditions that would make it impossible. It's a confidence trick both on their membership and the Scottish people." He may have over-cooked his case in some of his statements but on this specific issue he has a point; he's been quoted elsewhere as saying "while the alliance had no issue with non-nuclear members, it had no room for anti-nuclear ones"
International Monetary Fund, the World Bank Group and the World Trade Organisation.